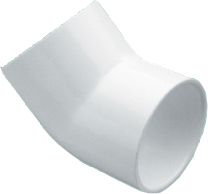 • Material conforms to ASTM D-1784 Type 1, Grade 1, white PVC. • Meets, or exceeds, ASTM D-2466 for socket type PVC fittings. • PTFE tape required for threaded fittings. • Use with Schedule 40 PVC pipe or IPS-sized class (SDR) pipe (pressure rated) systems. • Applications include irrigation lines, plant service water, utility piping, potable water lines.